11-Apr-2016 -- This is the last out of four reports reaching confluence points in Southern France. The story starts at 43°N 0°EW and continues from 44°N 1°W. In the morning of confluence day, my host family at the Chambre d'hôtes Chtipanier in Morcenx (80 km from the confluence) was so nice to prepare an early breakfast at 6:30 AM for me. With an early start I was hoping to make it to the confluence by bicycle and get back to Switzerland at the same day. From the city of Mont-de-Marsan I followed a “voie verte du Marsan et de l’Armagnac”. The term “voie verte” is mostly used for a former railway line that has been converted into a trail for hikers and bikers with smooth gradients and curves as well as bridges crossing rivers and roads. The confluence is located 2 km from the town Gabarret. I reached the town starving hungry, but was not able to find a shop or restaurant open due a public holiday. Finally, people directed me to a Super-U south of town where I got my stomach filled. Now I was ready to attack the confluence. On asphalted minor roads I got as close as 360 m to the confluence point. And on a forest track I was able to reach 200 m distance. There I parked my bicycle and walked over a stubble field consisting of last year’s relicts of corn. 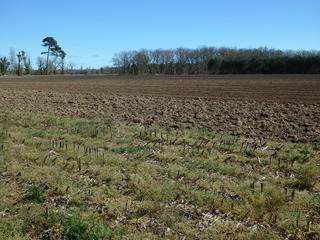 The confluence was just at the border of the stubble field and a freshly ploughed field. My way home was complicated: I first cycled further north-east up to the town Tonneins at the river Garonne, caught a train to Bordeaux. Cycled from the train station to the airport of Bordeaux (thereby experiencing a flat tyre which I had to ignore due to time constraints), took a flight to Genève and a train back to Zurich.